Streamline overseas shipping and simplify yard storage with shipping and storage cradles from Load Rite. We offer a full line of cradles for use in overseas transport or long-term yard storage. All of our cradles are made in the USA by expert fabricators. Load Rite shipping and storage cradles function in so many ways it’s amazing we hadn’t thought of them sooner. 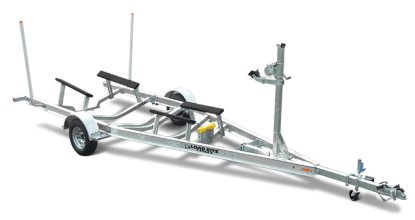 Utilize them to safely load and secure overseas shipments or as a simple, safe, and secure way to forklift boats around a storage yard. Replace teetering stacks of cinder blocks with carpeted bunks and a stable, safe platform. And unlike fragile wooden cradles, galvanized steel is an environmentally friendly alternative that will last a lifetime of use and reuse. Capacities from 3,000 to 15,000 lb.